Click here to receive Your FREE Guidebook Now! This FREE Guidebook Divulges Exactly how to Harness the Full Power of Your Intuition, so You Can Make the Right Choice Not Only Every Time… But Faster too! For the first time… you can discover the effective, yet profoundly simple secrets behind tapping into your intuition and using the power of your “sixth sense” to make quick and beneficial decisions …for FREE! Click Here to Receive Your FREE Guidebook! Consider This: How many decisions do you think you make every single day? On a daily basis, most of us are faced with relatively easy and inconsequential decisions, such as what to have for dinner (takeout or cook from home?) or how to spend our free time (gym or Netflix?). Yet, every so often, we’re faced with bigger life-altering decisions that carry significant weight, such as whom to marry, where to move, or whether or not to stay at our job or find a new path. The decisions we make, both big and small, are what define and shape our entire life! However, intuitive decision-making isn’t always the easiest thing to master… that is until NOW! 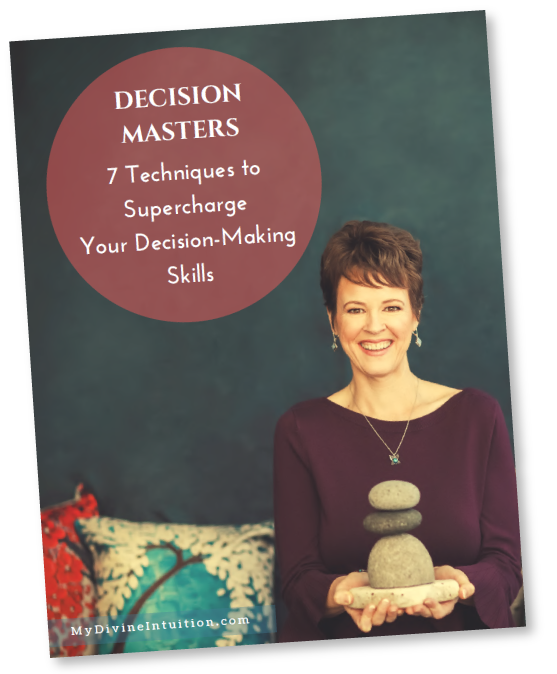 My guidebook will teach you 7 PROVEN DECISION-MAKING TECHNIQUES that will allow you to make surefire decisions that perfectly balance both your emotions and logic, ensuring you make the decision that is RIGHT for you on all levels! Hit the button below to receive your FREE guidebook!